Be the first to share your favorite memory, photo or story of Dan. This memorial page is dedicated for family, friends and future generations to celebrate the life of their loved one. Dan Fillingim, 67, of Elk City, Oklahoma formerly of Briscoe, Texas was born on August 4, 1951 in San Antonio, Texas. He is the son of Willis and Laverna (Evans) Fillingim. 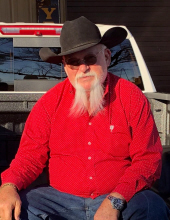 He went to walk with his Lord and Savior on Sunday, February 3, 2019 in Amarillo, Texas surrounded by his loving family. He married his best friend and sweetheart, Tamara Lynn Stanley on December 13, 2014 in Las Vegas, Nevada. Dan enjoyed traveling, fishing, shopping and going to auctions. He loved antique cars and was a collector of memorabilia. He was a member of the Elks Lodge. He will be remembered for his quick wit, generous heart and always enjoyed visiting with his friends. Funeral services will be held at 2:00 p.m., Friday, February 8, 2019 at the Trinity Fellowship in Sayre, Oklahoma. Daryle Perry will officiate. Interment will be at Gageby Cemetery in Gageby, Texas. Services have been entrusted to the care of Martin-Dugger Funeral Home in Elk City, Oklahoma. Cherishing his memory is his wife Tamara of the home; one son, Dallas Fillingim of Windthorst, Texas; four daughters, Lauren Millican of Elk City, Oklahoma, Lacey Millican of Cornish, New Hampshire, Kelcee Millican of Elk City, Oklahoma, Lindsey Thomas of Canyon, Texas; one sister, Mary Newman of Waxahachie, Texas; a host of grandchildren and numerous family and friends. He is preceded in death by his parents, Willis and Laverna Fillingim. Memorials can be made to the Providence Place, formerly, Methodist Mission Home in San Antonio, Texas in care of Martin-Dugger Funeral Home, P.O. Box 707, Elk City, Oklahoma 73648. To send flowers or a remembrance gift to the family of Dan Fillingim, please visit our Tribute Store. "Email Address" would like to share the life celebration of Dan Fillingim. Click on the "link" to go to share a favorite memory or leave a condolence message for the family.